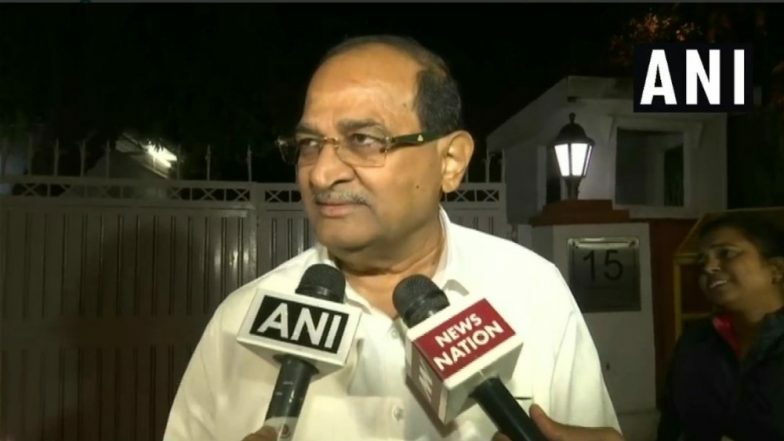 Ahmednagar, April 16: In what is likely to leave the Congress red-faced, the party's top leader in Maharashtra, Radhakrishna Vikhe Patil, was spotted campaigning for his Sujay Vikhe Patil, contesting on the Bharatiya Janata Party (BJP) ticket from Ahmednagar constituency in the Lok Sabha elections 2019. Sujay had crossed over to the BJP last month, after the Congress allotted the Ahmednagar seat to NCP. The Vikhe Patil family, which holds significant political clout in the district, was pushing for Sujay as the alliance candidate from the constituency. Vikhe Patil Resigns as Leader of Opposition in Maharashtra Days After His Son Joined BJP. The denial of ticket, however, forced Sujay to jump ship to the BJP, leaving the Congress camp embarrassed. On Tuesday, the senior Vikhe Patil was holding a public meeting in Rahuri town outside Ahmednagar city, which was mostly attended by sugarcane farmers. Addressing the gathering, he urged them to vote for Sujay in the upcoming polls, reported NDTV. Vikhe Patil, claims the channel, asked them to stop filming the rally, saying that the media has not been invited. On being asked by the reporters whether he is rebelling against the Congress leadership, Vikhe Patil denied, claiming that he has sought the party's permission to seek votes for his son. "I am very much with the Congress," he was quoted as saying. Vikhe Patil, serving as the Leader of Opposition in Maharashtra Assembly since 2014, resigned last month after his son switched over to the BJP. This sparked speculations that he could be following Sujay's suit. However, the Congress has reiterated that the senior leader is still associated with them. From the Ahmednagar constituency, NCP has fielded Sangram Arun Jagtap to take on BJP's Sujay. Polls in this parliamentary segment will be held on April 23, in the third phase of Lok Sabha elections 2019. In 2014, the seat was won by Dilip Kumar Gandhi of the BJP.